Iraqi war veteran Kimberly Walker no longer has the headstone her family wanted. Three-tour Iraqi war veteran Kimberly Walker was murdered on Valentine's Day, and her boyfriend Montrell Mayo, also a soldier, has since been accused of the crime. 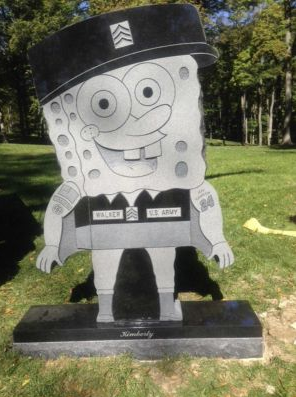 Meanwhile her family set about the sad task of laying Sgt Walker to rest, and chose her favorite character, Spongebob Squarepants, to stand at the head of her grave at Ohio's historic Spring Grove Cemetery. All was complete, the funeral over, and Sgt Walker interred; then, the day after the funeral, the cemetery called the family and said that it - and an identical stone put up for Walker's still living twin sister - would have to come down. They have since been removed. "We've decided that they aren't appropriate for our historic cemetery and they can't be displayed here," said cemetery President Gary Freytag. "I feel terrible that it got to this point but I'm hoping we can come out at the other end of the tunnel with a solution." The employee who helped arrange the burial and approved the headstone choice made an inexplicable error of judgement, claims Freytag. Spring Grove has offered to pay for the originals and for replacement stones. Spring Grove's first burial took place in 1845; Revolutionary War veterans, Civil War generals and Congressional Medal of Honor recipients are buried there. The cemetery has its own historian in residence, and conducts regular tours. "Cemeteries act as memorials to the past, and they offer a unique view of our history, culture, and way of life," Spring Grove claims on its site. The family is not impressed. "It is frustrating that you entrust a cemetery to have your best interest at heart and accommodate you and your family at a hard time," says Walker's sister, whose stone was also removed, "and because they don't like it they're going to take it down." The family doesn't want Spring Grove's money or its new stones; the family wants the one Sgt Walker would have wanted. Those wanting to know more about Sgt Walker should visit her tributes page.